In this installment, we’d like to give you a taste of The Season of Delicate Hunger, an anthology of contemporary Bulgarian poetry published in 2013 by Accents Publishing. The guest of this post is Katerina Stoykova-Klemer, editor and translator of the anthology. And remember, in February and beyond: read, write, and share your favorite translated poems. 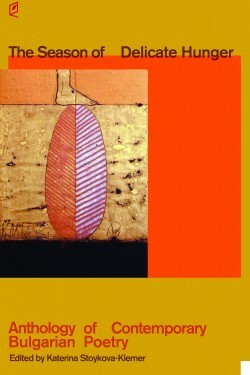 The Season of Delicate Hunger is a 334-page collection of contemporary Bulgarian poetry, containing 197 translations of works by 32 Bulgarian authors. All of these authors are alive, writing and actively participating in the Bulgarian poetry scene. They represent a diversity of talent, ranging in age from 72 to 21, with each at a unique stage of his or her career. My goal in creating this anthology has been to capture a cross-section of the contemporary life of poetry in Bulgaria and to present it to American readers in a way I hope they’ll find fresh, inspiring and engaging. I used four distinct criteria to select the participating authors: 1) the work should appeal to the American reader; 2) the poetry should carry well into English; 3) each poem should be interesting, fresh, unique and representative of the Bulgarian poetic voice; and 4) the words should convey a message about us, the Bulgarians, as poets and as people. I’ve translated all poems in this volume, with the exception of three authors: Zoya Marincheva translated Kerana Angelova’s work, Angela Rodell translated Ivan Hristov’s work and Dimiter Kenarov translated his own work. More details and ordering info can be found on Accents Publishing. You have an ax and an island. The island has a tree. Just enough to carve out a canoe. no, not on the shore—in the city. The boat has rotted long ago. You don’t know the name—you don’t ask—of that island. Ekaterina Yosifova was born on June 4th, 1941 in Kyustendil. Ekaterina is the author of 12 books of poetry, most recently This Snake, published in 2012, for which she received the national Ivan Nikolov Award in Bulgaria. Additionally, books of her poetry have been published in translation in Macedonia, Hungary and Slovenia. She has received numerous national and international literary awards, and her poetry has been translated into more than a dozen languages. She lives and works in Sofia. Mirela Ivanova was born on May 11th, 1962 in Sofia. She is the author of seven books of poetry, among which are Stone Wings and Memory for Details. Her poetry has been translated and published in many languages, and a collection of selected poems, Lonely Game, was published in Germany in 2002. 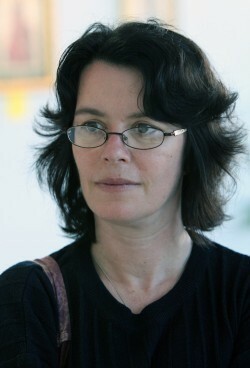 Mirela has received a number of Bulgarian literary awards, as well as the 2002 Hermann Lenz Prize for modern poetry from Eastern and Southeastern Europe. She currently lives and works in Sofia. Georgi Gospodinov was born on January 7th, 1968 in Yambol. He is a poet, writer and playwright, and one of the most translated Bulgarian authors since 1989. Georgi has published four poetry books that have received national literary awards. His poetry has appeared in many international anthologies, and his book Natural Novel has been translated into over 20 languages. He has authored screenplays, as well, including the short feature Omelette, which received honorable mention at the Sundance Film Festival in 2009. Georgi is an editor of the respected literary gazette Literaturen Vestnik. He lives and works in Sofia. It’s like the story of Polish poetry. that they do not carry the genes of gratitude. that you’ve needed a different tongue to keep from talking about it. Ivo Rafailov was born on February 25th, 1977 in Bourgas. He works as a graphic designer. Ivo is the author of two books of poetry, most recently Countable Temptations (2013), and he has received awards for both photography and poetry. Ivo is the co-founder of Frost Press, which has published collections of contemporary American poets in Bulgarian, including Billy Collins, Ted Kooser and Carl Dennis. He lives and works in Sofia. Katerina Stoykova-Klemer is the author of three poetry books, most recentlyThe Porcupine of Mind (Broadstone Books, 2012). Katerina is the founder of poetry and prose groups in Lexington, Kentucky. She hosts Accents – a radio show for literature, art, and culture on WRFL, 88.1 FM, Lexington. In January 2010, Katerina launched Accents Publishing.